Each of these 84 paper playing cards from 1894 consist of a category title, important names or events, and a brief history. The categories are: Kansas Pioneer Women, Pioneer Kansas Editors, Pioneer Kansas Newspapers, Kansas Writers, Kansas Missions, Kansas Forts, Historical, Kansas Massacres, Kansas Battles, State Governors, Kansas Officers and Institutions, Chief Justices of Kansas, Kansas Congressman, U.S. Senators, and Miscellaneous. They were made by Frank A. Root & Son in Topeka, Kansas. In his life Root worked as a postmaster, author, and newspaper owner. Each of these 84 paper playing cards from 1894 consist of a category title, important names or events, and a brief history. 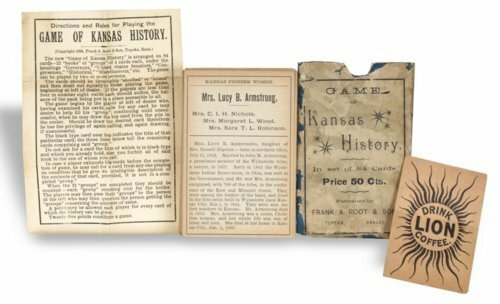 The categories are: Kansas Pioneer Women, Pioneer Kansas Editors, Pioneer Kansas Newspapers, Kansas Writers, Kansas Missions, Kansas Forts, Historical, Kansas Massacres, Kansas Battles, State Governors, Kansas Officers and Institutions, Chief Justices of Kansas, Kansas Congressman, U.S. Senators, and Miscellaneous. They were made by Frank A. Root & Son in Topeka, Kansas. In his life Root worked as a postmaster, author, and newspaper owner.